Dharma wheel on the roof of Jokhang Monastery, Lhasa, Tibet. 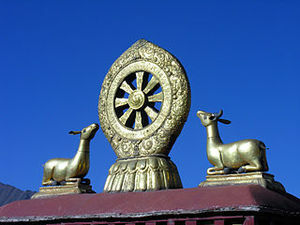 The eight spokes of the wheel represent the Eightfold Path. Also called the Middle Way. The message Gautama taught in his first sermon is still the cornerstone of Buddhism today: the Four Noble Truths and the Eightfold Path. (4) that the way to this liberation is through living the Noble Eightfold Path, which consists of right understanding or views, right thought or aspiration, right speech, right action or conduct, right livelihood, right effort, right mindfulness, and right concentration or absorption. Gautama explained that by avoiding the extremes of self-indulgence and self-mortification, one gains knowledge of the “middle path” which leads to insight, wisdom, calmness, knowledge, enlightenment, and nirvana. He advocated the Middle Way because he had learned from his own experience that the two extremes of sensual indulgence and harsh asceticism do not lead to liberation. In the ascended-master teachings, the first step of the Eightfold Path corresponds to the first (blue) ray of the will of God. Right Understanding requires self-analysis and the conviction that the Four Noble Truths are true. It is discovering and examining the problems if life—recognizing that one is out of alignment with the cosmos and making the decision to follow the Path back to integration with God. This involves faith and determination; it is the impetus, or power, of the Buddhic way. The Second step, Right Thought, is on the second (yellow) ray of illumination. It is the ray of intelligence which Buddha defines as the “intent of the heart.” Those who have pure motives in the heart have the pure intelligence of the Christ mind. We must transcend the sense of separateness and identify with the needs of all through consistency of intent in order to make progress on the Path. The third step on the Eightfold Path, corresponding with the third (pink) ray of divine love, is Right Speech. We pursue right speech by raising the energies of the heart and releasing them through the throat chakra. Always guarding the flow of energy, we strive to become, with Lord Gautama, the “Compassionate One”—modulating the voice for comfort and avoiding harshness to any part of life. The fourth step, on the fourth (white) ray of purity, is Right Action—the practical application of the Law. Right action can only be prompted by right motive, which necessitates that we reflect upon our motives in terms of selflessness and charity. Gautama gave five precepts of right behavior; do not kill; do not steal; do not lie; do not be unchaste; do not drink intoxicants. Right behavior becomes the discipline of the Law for purity in action. Right Livelihood, the fifth step, relates to the fifth (green) ray of healing, Truth, and precipitation. One cannot accelerate on the Path and precipitate the true abundance of God if one’s occupation pulls one in the opposite direction. In earning our living, we should not engage in any business that compromise the path of the Buddha—any activity that involves deceit, exploitation, injustice, or harm to others. Buddha actually listed certain occupations not in keeping with the Eightfold Path, including; poison peddler, slave dealer, prostitute, butcher, hunter, brewer, armament maker, and fortune-teller. The sixth step, on the sixth (purple and gold) ray of ministration and service, is Right Effort—exerting oneself for good through a strong will and steady “plodding” on the Path. The way of service and ministration is the way of proving in action the previous five steps of the Eightfold Path; it is the embroidering—the going over and over again—expressed in the life of constancy and dedication to the sacred labor. The seventh step, the seventh (violet) ray of transmutation and freedom, is Right Mindfulness—the “alchemy of self-awareness.” All that we are is the result of what we are doing at a particular moment. We use the fires of transmutation, the violet flame, to invoke the energy that consumes all of the blocks to the fusion of the mind on the action and the word of the moment. Right Concentration, or Right Absorption, is the eighth point of the Eightfold Path, which corresponds to the eight ray of integration. In Buddhist teachings, this eighth step involves meditation and proper breathing, as well as the techniques of Hinduism’s raja yoga (known as “the royal road to reintegration”). It is a means of finding integration in all of the chakras and in the I AM Presence through direct personal experience of God within by the science of the spoken Word. Mark L. Prophet, The Answer You're Looking for Is Inside of You. Pearls of Wisdom, vol. 26, no. 21. This page was last modified on 3 March 2017, at 00:40.